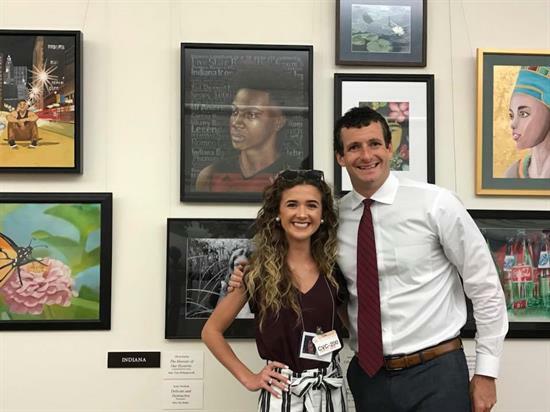 All high school students in Indiana's Ninth Congressional District are invited to submit their artwork to the 2019 Congressional Art Competition for the chance to have it displayed in the U.S. Capitol for the next year. You are invited to submit your original, two-dimensional artwork to either the Jeffersonville (321 Quartermaster Ct. Jeffersonville, IN 47130) or the Franklin office (100 E. Jefferson St. Franklin, IN 46131) for the contest. The submission and judging processes will both be digital. To submit, please send the required paperwork and a flash drive with a high-resolution photo of your artwork to either the Jeffersonville or Franklin office. The photos of the entries will be posted as an album on my Facebook page. The 2019 Congressional Art Competition Album will be publicly displayed for viewing and judging for two weeks. Local artists and individuals from the ninth district will judge the competition. To determine the winners, the judges' scores will be worth 80% of the overall score with the number of "likes" each submission receives on Facebook representing the other 20%. The contest will close on May 6, 2019 and the four winners will be contacted and announced shortly thereafter. First Place: Art will be displayed in the Cannon Tunnel of the U.S. Capitol Building and you will be invited to participate in a reception for 1st place winners from across the country. Second Place: Art will be displayed in the Washington, D.C. office of Indiana's 9th District. Third Place: Art will be displayed in the Franklin office of Indiana's 9th District. Honorable Mention: Art will be displayed in Jeffersonville office of Indiana's 9th District. When can I submit my art? Submissions will be accepted in either the Jeffersonville office or Franklin office from March 1 - April 15, 2019. March 1 - Art submission period begins. April 15 - Art submission period closes at 5pm. April 22 - May 6 - Art will be posted on Facebook. If you have any questions, please email Hannah.Fagen@mail.house.gov. I hope that you will take part in this wonderful opportunity, and I look forward to showcasing the talents of students from Indiana's 9th District! P.S. Pictured below is last year's winner, Olivia, and her artwork in the Capitol. I was honored to welcome Olivia to Washington and congratulate her on winning the 2018 Congressional Art Competition!